Apple is going to try and close the gap between its mapping application, Apple Maps, and Google Maps by deploying a fleet of drones to scan streets, according to Bloomberg. Details are sparse, but what we do know sounds absurd. Per Bloomberg’s sources, Apple’s drones will be able to collect new mapping data faster than the modified minivan it currently uses. The idea with drones is that mapping data would be more accurate and up to date as Apple can deploy them faster than a Minivan that has to navigate traffic. The drones would also be able to collect other data a minivan would struggle with, like street signs or construction occurring in a specific area. This sure sounds great in theory, but even from afar the project seems like a real stretch. Hey, I guess you will try anything when your mapping app falls so short of the competition. Apple Maps started out as a complete and total disaster, and has been struggling to catch up ever since. When it launched in 2012, the maps looked contorted and disgusting. In one amusing case, a grocery store was listed as a hospital. 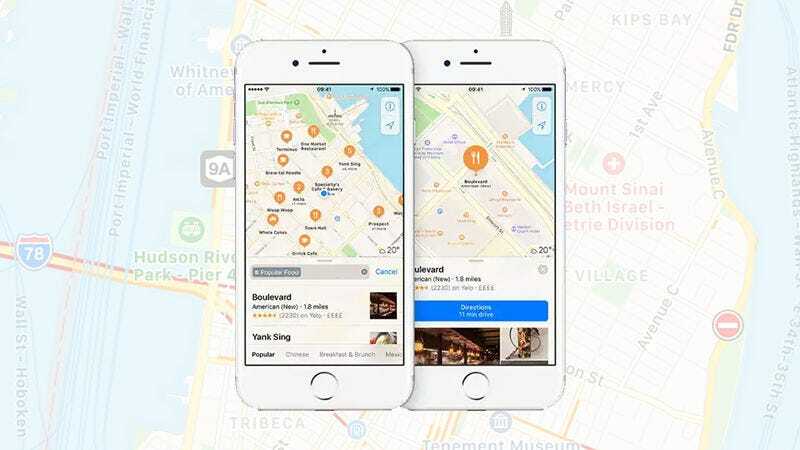 Apple CEO Tim Cook fired the product head Scott Forstall, and even went so far as recommending rival maps applications in wake of the backlash. Apple only got around to adding public transit directions last year, so it’s clear there is still quite a bit of work to do. Apple did add some useful integrations. Apple Maps today isn’t quite the horror show it once was, but any rational human would choose Google Maps. Even if Apple had some breakthrough drone technology, navigating the current legal frameworks of using drones for commercial usage is a nightmare. According to documents seen by Bloomberg, Apple was granted permission by the Federal Aviation Administration to “operate an unmanned aircraft system to conduct data collection, photography, and videography,” but only under strict conditions. The drones can only be flown during daylight hours, and licensed pilots must keep the drones within their line of sight during operation. Apple also can’t fly its drones over people and buildings. This seems to make using drones to collect the huge amounts of data that goes into a mapping application much more difficult. Even then, drones aren’t exactly the safest things around, and I’m not sure how comfortable people would feel with drones constantly filming and photographing the streets just above your head.